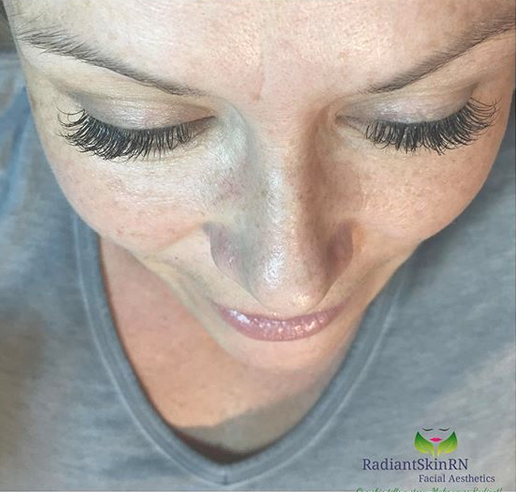 Xtreme Lashes® Eyelash Extensions were developed to mimic your natural lashes; the lashes have a tapered tip with a thicker base to resemble the look and feel of a natural lash. Xtreme Lashes® Eyelash Extensions is achieved by a meticulous and artful application of synthetic lashes, all applied one by one to each individual natural lash by a certified Xtreme Lashes® Lash Stylist. For those who want a very natural look or who would like to try Xtreme Lashes®, the Half Set is for you. 45-60 lashes per eye; 90 minutes. This full set of classic lashes completes your look with a voluminous set of professionally applied single layer lashes customized to your eyes with various length, thickness, curvature and color to make your eyes shine! 65-85+ lashes per eye; 150 minutes. First time re-lash service for new and/or existing clients already wearing lash extensions and transferring from another salon. 90 minutes. Please note: At the time of appointment, an assessment will be made about the quality of existing lash application. Please be advised this may require full removal and rescheduling of new set of lashes. RETURNING CLIENT RE-LASHES -- Please book according to the number of weeks since most recent re-lash appointment. If all lashes have shed, book the new full set you desire from the menu above.